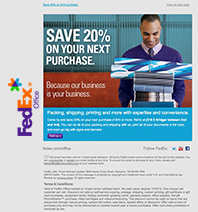 Sign up to receive news and offers from FedEx Office! Want to be the first to hear the latest from FedEx Office? Submit your email address below to receive news, promotions and special offers directly to your inbox. Please enter the required information before clicking submit.